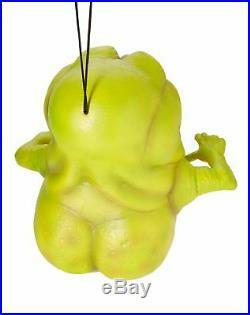 Spirit Halloween 17 Inch Hanging Slimer Decorations – Ghostbusters Classic. From the Tate Steinsiek Collection Exclusively at Spirit Halloween Officially licensed Dimensions: 17H. From the Tate Steinsiek Collection. Recreated with stunning accuracy with help from Steve Johnson, the creator of the Slimer from the original Ghostbusters film, this hungry ghost needs a new home to haunt. Hang him or place him anywhere you need some slimy scares! Spirit Halloween collaborated with award-winning special effects makeup artist, Tate Steinsiek for an exclusive, one-of-a-kind collection! Best known for the Syfy competition, Face Off, Tate was placed as the runner-up in Season 1 and 5. In addition, Tate won the “best of the Next in Horror” award at the Screamfest Awards. Product Features Sculpted by Tate Steinsiek Exclusively at Spirit Halloween Officially licensed Dimensions: 17H Material: Poly foam Care: Spot clean Imported. We reserve the right to cancel any order for any reason at any time. This item ships to the lower 48 states only. Our warehouses are located in different states in U. We try our very best to make sure every customer is completely satisfied. We will make sure to resolve your issue quickly. We welcome your good feedback and will return the favor by leaving good feedback for you. 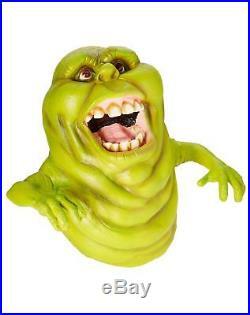 The item “Spirit Halloween 17 Inch Hanging Slimer Decorations Ghostbusters Classic” is in sale since Tuesday, December 11, 2018. This item is in the category “Collectibles\Holiday & Seasonal\Halloween\Current (1991-Now)\Yard Décor”. The seller is “click_n_get_store” and is located in West Hills, California. This item can be shipped to United States, Canada, United Kingdom, Denmark, Romania, Slovakia, Bulgaria, Czech republic, Finland, Hungary, Latvia, Lithuania, Malta, Estonia, Australia, Greece, Portugal, Cyprus, Slovenia, Japan, China, Sweden, South Korea, Indonesia, Taiwan, South africa, Thailand, Belgium, France, Hong Kong, Ireland, Netherlands, Poland, Spain, Italy, Germany, Austria, Bahamas, Israel, Mexico, New Zealand, Philippines, Singapore, Switzerland, Norway, Saudi arabia, Ukraine, United arab emirates, Qatar, Kuwait, Bahrain, Croatia, Malaysia, Brazil, Chile, Colombia, Costa rica, Panama, Trinidad and tobago, Guatemala, Honduras, Jamaica, Viet nam, Uruguay.